Food security is a huge and emerging problem facing global development. Huge numbers of people are already undernourished, and world populations are expected to rise significantly over the next 40 years. Sustainable agriculture is fundamental to global development. In Sub-Saharan Africa, estimates suggest that more than 50% of people rely on agriculture for their livelihood (Van Straaten, 2007) and in rural areas significant numbers are subsistence farmers – growing food to meet their family’s food requirements. Agriculture is a leading component of many developing economies. In Tanzania, for example, it is estimated that agriculture accounts for more than 40% of GDP and employs 80% of the workforce (CIA, 2011). For agriculture to be sustainable, it must be done in a way that makes it possible to continue using the natural resource (the soil) over significant periods of time. The soil is the source of the nutrients needed for crops to grow, and agriculture to be productive. In many developing countries, soils are becoming rapidly depleted of the nutrients required for productivity, through over-exploitation, and soil quality is decreasing. For agriculture to be sustainable the import of nutrients must match or exceed the export of nutrients. Agrogeology is the application of geology to agricultural practice, examining how soil nutrients, pH and soil structure can be improved using naturally occurring, mineral-rich rock materials. Rocks such as potash, gypsum, limestone and dolomite are rich in nutrients and can be used as fertilisers – directly added to the soil. One of the biggest challenges is replacing and increasing phosphates in the soil. Geologists can play an important role in identifying, mapping and utlising phosphate-rich rocks. Rocks such as scoria and pumice can be used to help retain water in the soil, and rocks such as limestone and dolomite can be used to decrease the acidity of the soil, raising the pH. 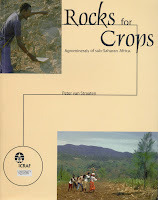 A key text, Rocks for Crops (right), outlining the principles of agrogeology can be found here. It is written by Dr Peter Van Straaten, a leader in this field, who has kindly made it freely available for people to read and use.